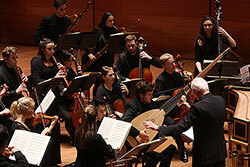 Early music authority, conductor, and harpsichordist William Christie with Juilliard415 perform a Handel cantata for soprano and instruments. Presented in collaboration with Juilliard Historical Performance. Juilliard415. Photography by Hiroyuki Ito.